Finding the best trimmers for stubble beard is a hectic job that many men face. When it comes to growing a beard, you can let it grow until it’s thick and long enough to work with. Stubble is another matter entirely. It needs constant care, which is often tougher than full beard maintenance. Thankfully, there are special stubble trimmers, which can make the job easier. Which one should you choose? We spent many hours choosing the top-3 stubble trimmers for your use. Let’s take a look at in-depth reviews and our editor’s pick. After closely reviewing dozens of stubble trimmers, our editor’s choice is Philips Norelco Beard & Stubble Trimmer Series 3000. This tool is versatile, offers a close trim, and comes with a fair price tag. We would recommend it to any man, who needs stubble maintenance. This trimmer is designed to deal with beards of various length, including a stubble. The battery is rechargeable and lasts up to 90 minutes. The trimmer does a great job shaping the stubble due to its high-quality dual-cut stainless steel blades, which are self-sharpening. The design is suitable for long-term trimming since the model provides a comfortable grip. The attachments are washable. You can also try the Norelco beard trimmer series 7200. We liked this fairly priced trimmer, which offers cordless use. It’s small enough for easy transportation during travel and big enough for comfortable shaving. The blades provide sharp cutting and great trimming. This is a great product for men, who need to deal with different hair length. Besides stubble, it takes care of mustache, nose, and ear hair. It’s designed to deal with detailing, which is important for men, who shape their stubble a certain way. The self-sharpening steel blades last a very long time. The price is low for such a versatile tool. Even though this product is not designed specifically for stubble trimming, it does a fairly good job. It comes with many combs and accessories, which are washable. It offers easy detailing and has a nice price tag. The two-year warranty makes us think that it’s a durable tool. This high-end tool is the best beard trimmer for stubble if you can afford it. It has a variety of options. The lowest trimming setting is 0.4 mm. The flexible head glides around your face curves, making trimming faster and easier. The blades are durable and self-sharpening. The ergonomic design makes the trimmer easy to hold. 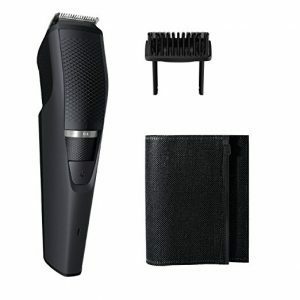 This trimmer is an excellent choice for men, who need detailed stubble trimming. It’s well designed and has many perks. However, it has a high price tag and many users report it breaking down fast. We went through a variety of trimmers. All of them have pros and cons. We agree with our editor that the best value for your money is Philips Norelco Beard & Stubble Trimmer Series 3000. It offers a precise trim, has an ergonomic design, and a long-lasting battery. Pay special attention to the trimming settings. The lower the setting a trimmer offers, the closer detailing you can enjoy. Look at the battery power. The longer the battery lasts, the less you have to worry about charging the trimmer on time. Consider the blade quality. Self-sharpening stainless steel blades are an ideal choice for a trimmer. Look at the versatility. The best stubble trimmers have added beard trimming and detailing options. Check if the beard trimmer offers cordless use. Corded trimmers are less convenient. Find out if the beard trimmer accessories are washable. It’s important for the trimmer maintenance. Consider the price. High price doesn’t always mean good quality. It’s possible to find a good trimmer in the $20 to $40 price range. Pay attention to the build. It should be easy to hold in your hand. Otherwise, trimming may be problematic. Use scissors to take care of long hair in order to make trimming faster and more precise. Shave the cheeks and sideburns before trimming your beard. Shave the hair below the neckline to make trimming more precise. Trim the edges of your stubble with a trimmer setting one step lower than for the rest of the beard. Use trimmer once every two days to maintain the stubble. Wash and clean all the removable trimmer accessories to avoid irritation and infection. Always use an aftershave lotion after trimming your stubble even if you didn’t shave. Watch out for ingrown hairs. They can ruin your excellent stubble look. Q: Can I use a regular beard trimmer without attachments for stubble trimming? A: Yes, you can. However, it may take you a while to get a hang of the process. A: Washing the whole trimmer can lead to its breakdown. You can only wash removable accessories. Q: Can I use stubble trimmer for my full beard? A: Yes, but only if it comes with proper attachments. Finding the best beard stubble trimmer may be harder than growing a full beard as there are plenty to choose from! We hope these honest reviews shine some light on your search. Let us know if you’ve chosen one of these tools and what you think about our reviews.